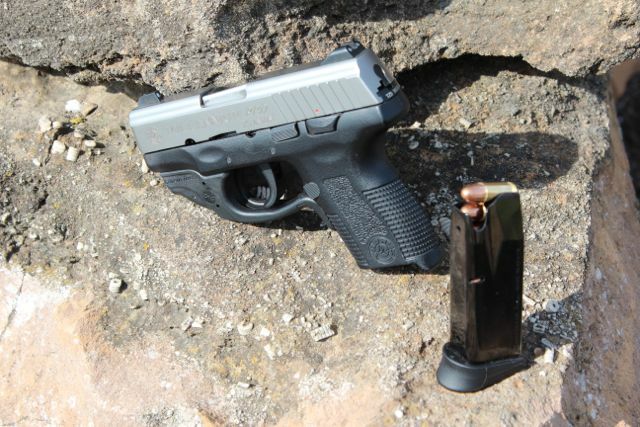 Over the years I had entertained the idea of a small concealable handgun. I bought a nifty little Star 9mm Largo years earlier because it looked like a 1911 Colt, well … okay, sort of. I sent it to my pal Pete Single and he performed some magic but this is still a large gun. So I was nosing around my local dealer not long ago when I noticed a used Taurus PT 111 Millennium GII double stack 9mm with a Crimson Trace installed. The price was right so I bought it. I guess I could have shot it first BUT I told Brian (the partner) that if I didn’t like the gun it was coming back. He understood. Besides, we don’t have any indoor ranges in town and it is pretty dark when I get home. Although now I have some extended daylight IF the weather is clear. So … I did shoot it over the weekend. My wife Sandy, Janine our daughter in-law and I all shot it. Our son was off doing something so it was just me and the girls. The first thing I noticed was it is difficult to load the double stack magazines for this little gun. The mag springs are pretty darned stiff or I’m pretty weak or it could be a combination of both. No matter, I had a sore thumb and two empty magazines after our shoot. The gun came with a Crimson Trace installed which is a nifty addition but not all that helpful in bright sunlight. Inside or after dark it is quite nice and as soon as I get it truly zeroed I’ll be even more happy. So I’ve got the mags loaded and found out that the little red dot isn’t visible in bright sun light. But the sights are very good, 3 big white dots the seem to align pretty instinctively for me. Time to shoot. Sandy didn’t want to be first and Janine wasn’t there yet so I was the elected guinea pig. Great! I bought it so I’ll shoot it. I grabbed the little gun and the sights fell right on the 25 yard target and BAM! The little gun bucked and snorted but the bullet hit slightly low and left. I was shooting at a 4×4 inch block of wood and I think I only hit it twice out of 12 shots but all the shots were pretty close, maybe within a 10-12 inch circle. I was kind of disappointed, but short barrels are hard to shoot accurately or so I’ve been told. I was most surprised by the recoil of the little gun and the bark. 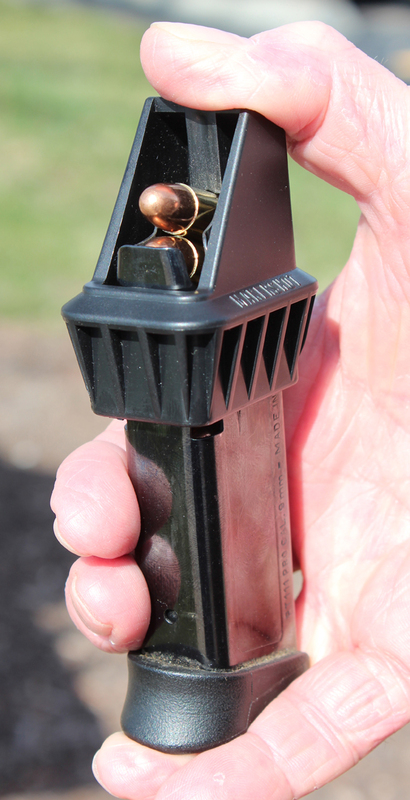 I had gotten a box of PMC factory 115 grain FMJs with the gun and I was thinking heavier bullets at the same velocity would definitely be a handful as I handed the gun to my wife Sandy. We went through the controls and grips and anything else I could remember to tell her. After a little familiarization she slapped a loaded mag in the little Taurus and took aim. The double action trigger proved to be troublesome for the first shot but after that she was slingin’ lead … literally! After three shots I stopped her to allow her to relax and get a better grip also to remind her of where that left thumb went and to squeeze, not yank. The rest of the magazine went well but she was not anxious to repeat and Janine had just gotten there. Now it was her turn. Janine is a not a shooter and is sort of apprehensive of a gun, especially a pistol. So I made the gun safe and we had an impromptu gun handling course. After that she was ready to give it a try. Her first shot was a big surprise and drew a squeal with a big smile. Her second shot was close but didn’t feed for the third. Her impact got better but her light grip was causing functioning problems. Not surprisingly she was ready to quit after about the 6th shot. She handed the gun back to me and I finished the magazine. The block of wood lives for another session. So that is what we did prior to the Super Bowl. It is readily apparent that we all need trigger time, the more the better. I need a brass catcher of some sort because we only found about 80% of our spent brass. I also think 25 yards is a LLLong ways for a 3.2 inch barrel and about 4 inches of sighting plane. I think 10 yards might be better and 3 or 4 even better. I have to say that this is a nice little gun and I found a gadget (Makershot) to assist me in reloading those stiff mags. The Crimson Trace is a good add-on also and the girls really appreciated it. After all my complaining my “buddies” finally advised me to leave the magazines fully loaded and they would be much easier to reload the next time. Sure, now they tell me. I also figured I could save the cost of a big tarp in salvaged brass on my next trip. Isn’t it amazing how when you don’t need brass it is available everywhere but need just a few and you can’t find it anywhere. Must be the law of supply and demand. This entry was posted in Uncategorized and tagged 111 millennium GII, 9mm, 9mm handgun, 9mm pistol, Colt, Crimson Trace, handgun, pistol, taurus pt 111. Bookmark the permalink. Good choice. I’m a rifleman who got interested in combat pistols in the 70’s, after that I was a 1911 guy. The Taurus PT-111 Millineum G2 is what my wife and I carry daily. I like the controls being in the right places, moving the right direction. I like having more rounds before reloading, and magazine swaps are very quick. 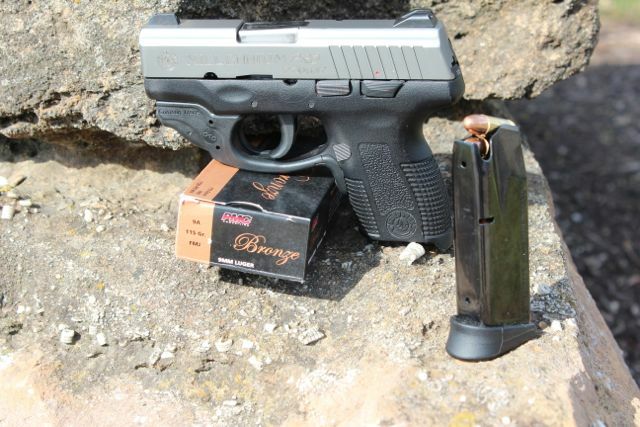 The pistol fits well, and shoots extremely well 3″ @ 25 yds offhand. Recoil very controlable, and the agressive stippling makes it easy to hang onto. Was carrying IWB, until recently when I found Holster from Safariland thats near perfect. UpLulu magazine loader makes magazine reloads luterally childs play. Recovery and second shots much quicker than 45. And finally, the price makes it a pistol I won’t mind turning over to police if I ever have to use it. You took the words right out of my mouth John. Now … If i can just learn to shoot these short barrels. I did a lot of Metallic Silhouette competition after I learned combat pistol. The takeaway for me was that a very firm (as in crush it as hard as you can without shaking too much) grip, and positive trigger control (dry fire with a coin balanced flat on your front sight until it doesn’t fall off – double or single action) are the key to accuracy. Sight alignment (at combat range) is secondary to keeping the gun correctly aligned and following through on each shot. Good work Rich. Yes little guns are tough to learn, especially when we’re not really current with pistols. I know your Star is bigger but easier to shoot I’ll bet. Lots of Sierra bullets down range and I’ll bet the group’s get much smaller😊. Hi Chuck, it is good to hear from you. Those of you who read this need to disregard that next to the last sentence and substitute the 125 grain Sierra. Other than that Chuck has a valid point BUT he only has 5-6 shots and I’ve got 12 and I’m sure I’d need all 12. Seriously, small handguns are hard to choose so handle as many as you can and shoot as many as you can and hopefully your choice will be the right one for YOU. I’m not sure my little Gen II will be the best choice forever but for now it is a nice fit.